The Relentless Builder: Kini Big Deal with Handshakes: Firm or Just Touch-and-Go? 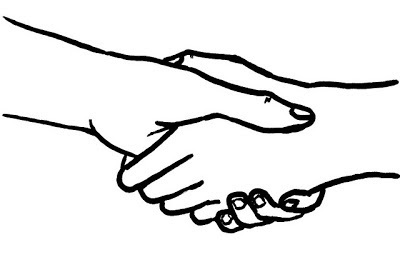 Kini Big Deal with Handshakes: Firm or Just Touch-and-Go? One of my least favorite parts of any church service is when whoever is on the pulpit announces: "Now, turn around and greet the people around you." Why? Because it is certain to involve two activities I am not fond of: hugging (for the women) and shaking hands (for the men). You probably can't tell from the look on my face. I hope. I will speak more on the hugs in a separate blog post (believe me, it deserves its own space). But today, I wanted to deal with the handshake part. You see after that announcement, you usually get a feel for different types of handshakes, ranging from the firm handshakes to the ones I like to call 'touch-and-go' (usually from women). The 'touch-and-go' handshakes are particularly fascinating to me because the people who initiate these handshakes barely touch your hands as if you have craw-craw or some other skin ailment on your hands. Seriously, I don't think I can even call it a handshake. And then there are those who cannot decide whether to grasp your hand firmly or just sniff stare at it. They grasp your hand and then drop it suddenly as if they just saw Willi-Willi materialize behind you. Not cool. Making a good first impression in any public business setting starts with a firm handshake. This rule applies to both men and women. [Source] Hooray! That takes care of the 'lady-like' bit. Finger shaking is forbidden. [Source] Skipping for joy! By all means, wash your hands after shaking hands with people. Who knows where those hands have been? This is my own jara, by the way. If you are interested in learning more, you can check out this list of 10 Nightmarish Handshakes to avoid. How do you usually shake hands with people in public settings? Do you prefer a firm handshake or the 'touch-and-go,' or better yet, no handshake? Kindly share. Before, I leave, here is some music courtesy of C.I.A (Christ I Abide). It is called 'What You Do.' The review will be available in a separate post. Enjoy! I love firm handshakes, and I can't stand the wishy-washy ones either. However, I have two issues with handshakes aside from the tendency to exchange germs. I can't stand when people shake me with sweaty palms...i will pass on that. Also guys who firmly shake your hands and almost break them especially when I have rings on which is often. Those things hurt when you squeeze them hard...geez! I also prefer the firm handshake. Some of the scenarios you described had me laughing. I love to hug rather than shake hands most of the time and that's because I feel I dont have soft palms, but in other times, a firm handshake does it for me. How have you been? since you have blogged, I believe you are okay where you are, yes? hurricane sandy no come your side abi? I thank God for your life my sista. Funny enough, I was reading about handshakes 3 weeks ago when working on a proposal. And your conclusion about firm handshakes is right. I really think you should start an etiquette school. You are really passionate about these kinda topics. I prefer firm handshakes. I want to know your opinion about hugs oh? Please write the blogpost. Toin: Thanks, Feels good to be back. 9jaFoodie: Those words (confidence and precision) came up in the searches I made, so you're definitely on point with your comment. I don't know why anyone would want to give anything less than a firm handshake. AdeOla: You have successfully described two types of handshakes I discovered too: (1) The 'Clammy' Hands and (2) The 'Bone-crusher.' I won't bother trying to find out who came up with these names, but those types of handshakes can be very annoying if you're on the receiving end. Myne: Same here. Firm handshakes all the way. As for the scenarios, seriously, I have witnessed these reactions. Strange things! Lue: Thank God I am not the only "anti-touch-and-go-handshaker" in the building. I concur. Definitely, not cool. Priscy: Ah! You are a hugger, I see. Funny enough, you're not the only woman I have heard complain about not having soft palms. I don't see it as an issue o. I would rather shake hands than hug anyday, but that's just me. Oh, thank you so so much for asking after me in light of Hurricane Sandy's craziness. Thankfully, I don't leave anywhere near the path of 'that' hurricane, so all is well. Thanks though for the concern. May God help those who are hit though. It's not even funny. Atilola: Aha, thank you for confirming that firm handshakes are the best! Etiquette school ke? Not a bad idea though. Thanks for the suggestion. Victor Iweanya: I love firm handshakes for sure. For me, it's an opportunity to communicate through accepted body language. Winking is not an option ... Lol! You know I was just asking my housemate why churches must do that 'turn to your neighbour' thing. So uncomfortable! Lol. Waiting eagerly for your hugging post! @0fdab4953165c5002cbd9cda575e67f7:disqus : So you both had that discussion too? Glad to see you ladies share my sentiments on this one. The hugging post draweth closer. I'm looking forward to it too. I was a lover of soft handshakes. Warm and allowing the palm slide over each other as they release. This was until my hand was gripped by a client. Oh the horror! It was only months after that I read it in a book that it was appropriate for business settings. A lady once shook my hand firmly and I had this surprised look in my face and she smiled cuz it didn't just feel lady-like to me. As for touch-and-go, I think those people should not even be shaking in the first place. Hian! Michael: Was there also an evil glint in her eye as she squeezed your hands? Lol! Sounds like a horror story for you at least. Me, I prefer firm handshakes o, so touch and go is annoying to me. I would rather you just waved at me across the room. Kelly: Yay! Another lover of firm handshakes in the building. Whoop! Whoop! Michael: Thanks for warning me. I will be ready for you if you try it!